I've driven all over the country - from Seattle to Palm Beach with one of those standard eight inch wheel trailers and I can tell you they work just fine. Had a flat tire once in the Idaho desert and the tire was ripped to sheds (forget about "Fix a Flat" tire repair in a can); I admit I was going eighty MPH at the time, but the trailer remained stable during the blow-out. 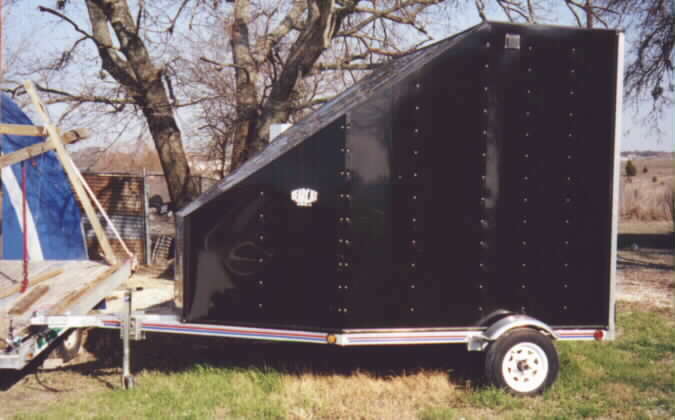 Enclosed trailers are really the best all-round choice, but for short hauls to the flying field, small flatbed trailers or towing type trailers offer improved gas mileage which can add up and a few bugs to wipe off is a small inconvenience. On long hauls, the engine and vital controls can be wrapped and the wing stored inside the trunk. I position my machine backward so that the weight is at the tongue end rather than the rear to prevent fish-tailing or whip action. On my old single place, I had a shock absorbing device that would take the weight off the suspension (axle and wheels) to eliminate bouncing. In addition to a spare tire, it's also a good idea to have an extra set of wheel bearings (and the tools you would need to make a repair). Use the standard wheel bearing grease and never mix this "brown" or "black" grease with the "high speed" or "blue" types. If you decide to switch to the blue you must first remove all trace of the brown and this is a pain in the you know what and the average do-it-yourselfer is likely to leave behind traces of cleaning solvent and micro-wads of cotton fiber behind in the "cleaned out" bearing and then introduce fresh grit when "palming" in the more costly, new and improved blue grease. Brown grease will work just fine! Pack the wheels with grease but don't over do it - "buddies" are a good idea, but if you see grease all over the inside, or inner side of the wheel and trailer bottom, you know you have too much. Always check the trailer out closely at stops and maintain proper tire pressure. Here are a couple of specially made trailers that cost in the thousands. These things are the Mercedes of ground hauling. Water tight, secure and just the right size for everything (except my wallet). The first one holds a single PPC, the big one looks like it can handle a whole lot more. If you're really interested in either of these types of trailers email the author and I'll find out where they came from.